Credit: Urawa Zero/Flickr/CC BY 2.0 licensed under . Credit: motoshi ohmori/Flickr/CC BY 2.0 licensed under . Credit: Boyfriendback/WikiMedia Commons/Public Domain licensed under . Credit: Tzuhsun Hsu/Flickr/CC BY-SA 2.0 licensed under . Credit: Toshihiro Gamo/Flickr/CC BY 2.0 licensed under . Credit: Gemini st./Flickr/CC BY 2.0 licensed under . Located in the northern part of Tokyo, Adachi-ku (Adachi City in English) is a ward of 53.25 km2 with a population density of 13,010 people per km2 in 2015. It is transected by the Sumida and Arakawa rivers, which slice it into two separate areas, with the bottom area closer to the city centre proving to be the more popular one. The ward borders cities in Saitama Prefecture and fringe wards in north Tokyo, which are all considered shitamachi (literally meaning ‘under city’, referring to the geographically lower-lying parts of Tokyo away from the centre). Quiet and favored by Japanese rather than expats, it might not be the trendiest borough, but it ranks among the top five cheapest wards to live in while still offering a convenient commute to the city. Suburban, traditional and slow-paced sum up Adachi. Kitasenju, sandwiched between the Sumida and Arakawa River, is the most well-known station in the ward and favoured by its younger residents. It is famous for its annual summer firework display and boasts a number of shopping malls surrounding the station as well as streets lined with bars and restaurants. It is a 25-minute commute from Kitasenju Station to Tokyo Station. Farther north of Kitasenju, the ward has a more suburban feel. Detached houses and low-rise apartment blocks dominate, with local temples dotted in between. Besides its cost while still offering convenient access to the city centre, one of Adachi's main draws is its green spaces. Both riverbanks are popular with runners and cyclists, or for a leisurely stroll with the dog among the elderly population of the ward. Several parks offer opportunities to relax for the locals: Toneri Park has public sports facilities on one side and a landscaped park with a pond and bird sanctuary on the other. Tokyo Budokan, a large martial arts sports hall, is located within Higashi Ayase Park, which also houses a beautiful Japanese garden. Adachi Park of Living Things is a popular weekend spot that in essence is a small animal park with a petting zoo and an impressive butterfly house. One drawback is the distance of the northern parts of Adachi to the city centre, which can be up to a 45-minute train ride to Tokyo or Shinjuku. In December 2017, 688,857 residents were registered in Adachi ward. Of these, 31,727 were foreign, a little under 5%, making it the highest foreign population in any Tokyo ward after Shinjuku and Edogawa. The biggest groups are nationals of Korea and the Philippines. The ward’s population is increasing with every year, and so is the percentage of elderly living in Adachi. In 2017, 22.2% of inhabitants were seniors of 65 years or older. In general, the northern parts of Tokyo have a reputation for being a haven for the elderly. The area around Kitasenju is however known to be popular with young people, especially students that attend universities in the northern part of Tokyo and also foreign exchange or Japanese language school students. Kitasenju Station has several big malls, including a Marui and a Lumine, two of the most popular fashion malls in Japan targeted at younger people. For the rest of ward, the extent of shopping is limited to supermarkets and shotengai—narrow shopping streets lined with small, usually independent shops offering a mixed bag of wares and services. Shorakudo Hospital is located close to Kitasenju, while Umeda Hospital, the Adachi General Hospital, Adachi Tobu Hospital and Sonoda Daiichi Hospital service the rest of the ward. As none of them list English-speaking services, those with no Japanese ability might have to look to international hospitals in other wards. There are fitness facilities, including 24-hour gyms and boxing gyms, located all across the ward. Gold’s Gym has a branch in Kitasenju, and a Tipness fitness studio, as well as several yoga studios, are located around Ayase Station. While Adachi has no international schools, at least one international pre-school exists: Aloha International Preschool. Some supermarkets catering to international tastes can be found. A Seijo Ishii import store is located in Kitasenju Station, Nihon International Ltd. is a halal food store in Sekibara, and a Bonne Sante discount supermarket with a good range of import products is located in Ogi. Kitasenju, the busiest station of the district, is located in its most southern parts and connects you to Otemachi in 16 minutes on the Chiyoda Line and to Ginza in 25 minutes via the Hibiya Line. To Haneda Airport, you are looking at a 55-minute trip, while for Narita Airport you should budget around an hour or more, depending on the connection you choose. For the stations located further up north in the ward, add up to an additional 25 minutes to these commute times. According to Uchi no Kachi, the average rent in Adachi City is around JPY 2,400/m2 and the average rental property size 36.5 m2. Therefore, a studio apartment of 25 m2 would cost approximately JPY60,000 a month plus utilities, and a 1LDK suitable for a couple around JPY120,000. 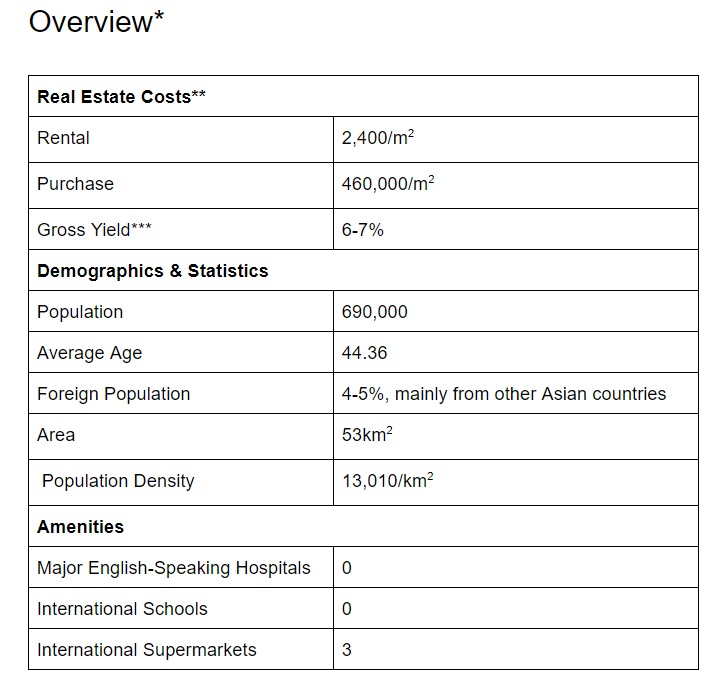 The average price to buy an apartment in Adachi-ku is 460,000 yen/m2. However, this fluctuates greatly depending on the nearest stations. While buyers will need to fork out just over 500,000 yen/m2 for an apartment in the Senju area (including the ever-popular Kitasenju), in an area like Ikkoh, apartments are only around 290,000 yen/m2. The average detached house in Adachi is around 90m2 and set a buyer back JPY35 million.